OP3215. 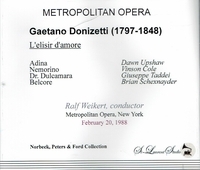 L'ELISIR D'AMORE, Live Performance, 20 Feb., 1988, w.Weikert Cond. 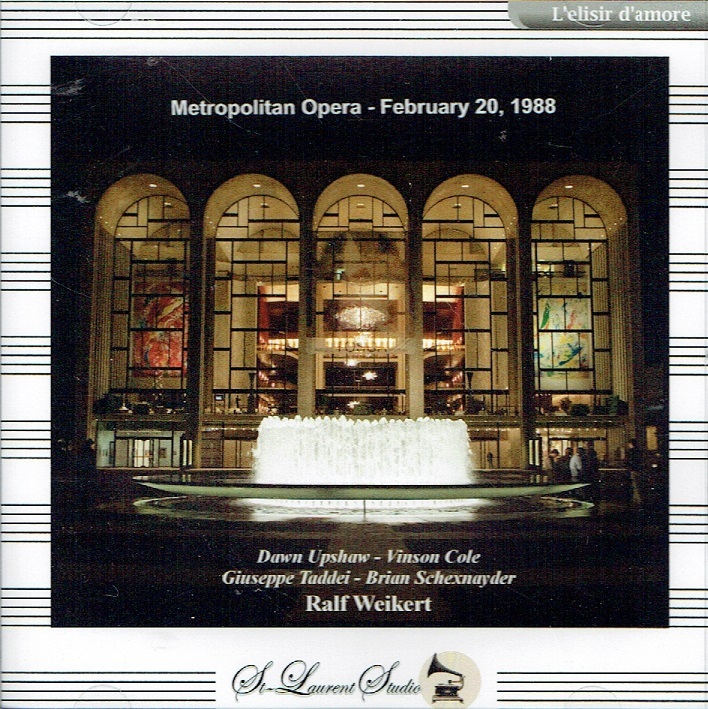 Met Opera Ensemble; Dawn Upshaw, Vinson Cole, Giuseppe Taddei, Brian Schexnayder, Dawn Kotoski, etc. [An exceptional and little-known latter-day broadcast from the Met featuring two young singers in the prime, plus the veteran Taddei at his most compelling! Of further note, Ralf Weikert appeared at the Met only briefly in a departure from the Salzburg Festival and the Mozarteum Orchestra Salzburg.] (Canada) 2-St Laurent Studio stereo YSL T-516. Transfers by Yves St Laurent. "Dawn Upshaw was 28 when she was called upon at the last minute to substitute for Kathleen Battle for a performance a few days prior to this broadcast. The broadcast was the second in the run. She apparently went on without the benefit of a full rehearsal. We tend to think of Upshaw as a specialist in contemporary music, and also perhaps Bach and Mozart. Her name does not come readily to mind in the comic bel canto repertoire, but she is a complete success here. Her sense of the Donizetti style is remarkable for the natural shape of the line. Her evenness of tone as well as its bright glow, along with her charm and natural flair for comedic timing, make this a performance to treasure. In the duets and ensembles Upshaw sounds as if she had been singing Donizetti her whole life. There is a warmth to her portrayal that brings a smile every time she opens her mouth, and coupled with her lovely timbre, the result is stunning. Vinson Cole has a very attractive lyric tenor - in 1988 it was a warm, sweet voice that caressed the music attractively. Here Cole also sings with real flair and specificity of inflection. In the duets with Upshaw, whether comic or tender, they sound as if they had been singing the opera together for years. 'Adina credemi' is delicious in its lyrical warmth. I don't envy any tenor singing 'Una furtive lagrima' in an opera house where many have memories of recordings by some of history's greatest tenors (Tito Schipa, Jussi Bjorling, Josef Schmidt & Carlo Bergonzi) in their ears. But Cole makes his own mark with a sweet tone and delicate shadings, very clean passagework, and a lovely floated piano. The ovation he gets is well deserved. Giuseppe Taddei was one of the finest Italian baritones of his generation, although he made his belated Met debut when he was 69. By the time of this broadcast he was almost 72, and focusing no longer on Scarpia or Amonasro but on basso buffo roles. One cannot pretend that Taddei's voice is in great shape here, but he surely knows the idiom and has a great deal of fun as the quack who peddles his love potion. He makes a real success of the role with fabulous diction and a very strong rhythmic pulse. One doesn't look to Dulcamara for rich vocalism. Brian Schexnayder is an adequate Belcore, no more, no less. He sings the music accurately but is less of a vocal presence than the other three lead singers. Dawn Kotoski (uncredited in St. Laurent's documentation) is the excellent Giannetta. Rolf Weikert is clearly an experienced opera conductor who keeps things moving at a nice pace, but also conveying the grace and elegance in this score. There are many reasons to welcome this release, not the least of which is that it broadens our knowledge of one of America's most talented sopranos. This is available from Norbeck, Peters & Ford (www.norpete.com)." “In her novel THE SONG OF THE LARK, written in 1914, Willa Cather tells of a singer, Thea Kronborg (modeled on the soprano Olive Fremstad), as she progresses from a sturdy childhood in Moonstone, Colo., to triumphs in her early 30s at the Metropolitan Opera. ‘Thea's scale of values will always be the Moonstone scale’, she writes. ‘And, with an artist, that is an advantage....It keeps them from getting affected...keeps them from getting off the track generally’. Dawn Upshaw has established a distinctive place of her own as an opera singer and recitalist [and] has much in common with Cather's heroine: She found her vocation only in her late teens but was then drawn irresistibly to the expressive bonding of words and music. Her artistic development came quickly and was sustained by values acquired early in life. 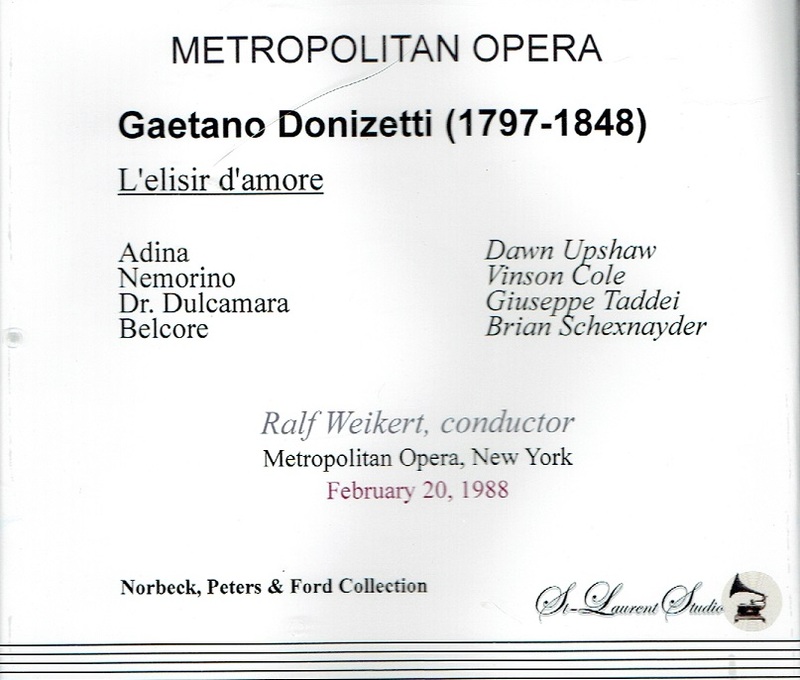 In 1988, Ms. Upshaw's operatic career advanced unexpectedly when, on an hour's notice, she was called on to replace an indisposed Kathleen Battle as Adina in Donizetti's L’ELISIR D'AMORE. ‘I had never rehearsed the opera from beginning to end, and never with orchestra’, she said. ‘The greatest difficulty was gauging the amount of stamina I needed to get through the evening’. John Rockwell of THE TIMES called the result ‘a highly successful, charming performance, as might have been expected from one of the most critically admired singers of her generation’." "Taddei sang eleven Met FALSTAFFs in the 1985-86 season and returned to the company in 1988 for ten performances as Dulcamara in L'ELISIR D'AMORE, another of his signature roles."